Valspar Spray Primer - White. Run away from this stuff. They sell it at Lowe’s and at Tractor supply. I couldn’t find any of my beloved Zinsser white or clear so I gave this a try in priming a raw birch plywood desktop for a customer’s built-in desk. Long story short: I sprayed, It dried (slowly). When finally dry, I tried to very lightly scuff sand before applying finish paint and it completely gummed up my paper AND made little white dough balls over the surface. I scraped it all off with a 5-in-1 tool, then used a Rustoleum product (still not as good as Zinsser primer) that did dry and sand well enough to allow me to spray the gloss black desk top. BTW I did take the nearly empty can back to Lowe’s and got a refund. 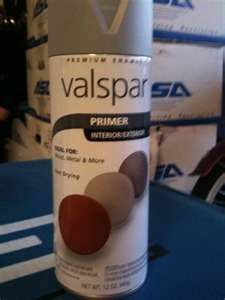 The Valspar rep happened to be at the store and I talked with him about it. He knew (already). Sorry about the bad experience. I used to do some auto body work and metal prep for painting. There used to be primers for painting on metal that would specifically state if they were sandable or not sandable primer. I know we always purposely bought the sandable variety. Also, some primers are designed so as to etch an existing surface (such as one that is already painted or finished) in order to avoid having to scuff sand prior to painting. These, in my opinion are a lazy mans way out and not the best solution. If it eats into the existing surface, there is likely to be some chemical that will eventually damage the finish you want to apply over the top of it. Anyway, I don’t know if this could be the case in your situation, but still worth noting, always be sure to use the right product for the right project. Also, I would agree, for anything wood, it is hard to beat Zinsser. The only Valspar products I have used before are their polyurethanes finishes and I have not had any issues with those to date. He knew (already). But they kept on selling it. My son bought a gallon of titebond III glue at home depot. Got it to the job site and it was hard. Took it back to home depot and they wouldn’t take it back because it was open. You can image the rest of the conversation. @DonW, The same thing happened to me, but it was a bunch of tubes of glass block adhesive ($12 a tube) from a case we had bought about 6 weeks before. I had the receipt. No shelf life info on the tubes. I said okay, then I don’t have a receipt. I bought it yesterday. They still said they COULDN’T swap out or give a store credit because it had been awhile and some were opened. Jeez ! I asked who COULD. I told them I wanted to talk to THE PERSON that had the horsepower to OVERRIDE their policy and they better get him up there or I would find his office and tap dance on his desk. They gave in without waking the GM up. Were you able to save the desk so that the customer couldn’t tell? It is really too bad that when we expect something to work the way the company claims, we usually get burned. i am experiencing the same problem. i recently primed a new project and 3 days later and its still tacky. i got the dough balls too! i could choke the head Valspar right now. GARBAGE. I apply their primer to the door of a pull out pantry. sanded when it was dry. got tons of tiny balls. I blame it on me. I was able to salvage that top because it was so gummy it all scraped off. Then I sanded, primed with good stuff, sanded and three spray coats of finish. But man, that COST me !!! Never again…. Trust me, the Zinsser oil or lacquer-based primers are just awesome. I am sure there are others, but they are the best I have found out of a rattle can.